Name: Missile Phalanx "Deuce of Spades"
In Part 2 of my 4-Part 1/100 Destroid Model Kit Shoot Off, I would like to revisit the 1/100 Destroid Missile Phalanx, originally released in 1982 by Imai and later reissued in the 1990’s by Bandai, whom is still currently producing the kit. For my Part 1 review of the 1/100 Arii Destroid Defender Click Here. 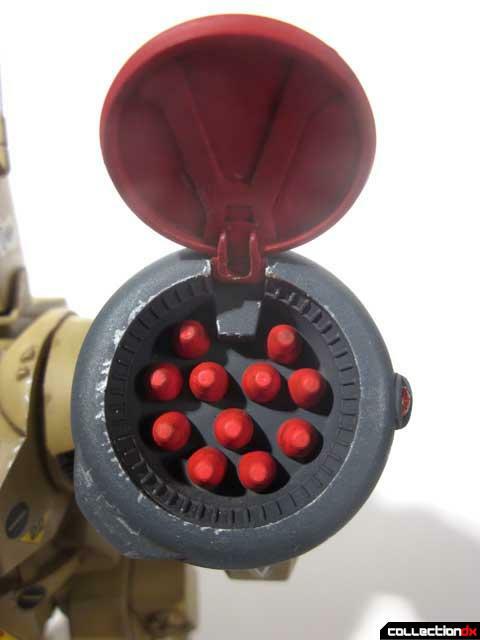 For my Part 2 review of the 1/100 Imai Missile Phalanx Click Here. 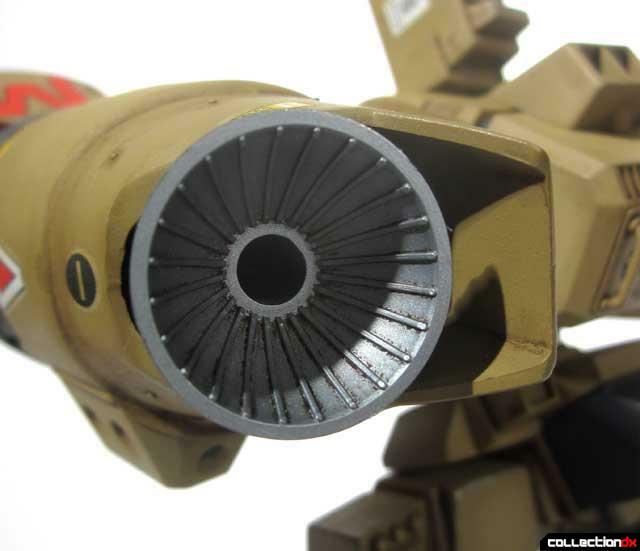 For my Part 3 review of the 1/100 Imai Attack Tomahawk Click Here. 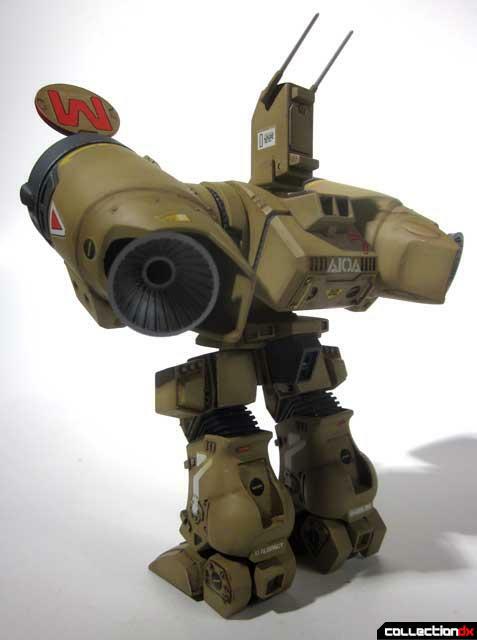 For my Part 4 review of the 1/100 Arii Spartan Click Here. 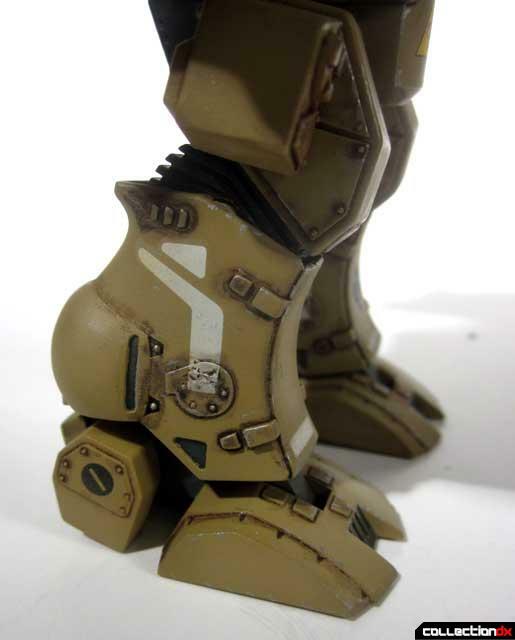 For my Part 5 review of the 1/100 Arii Spartan Metalize Custom Click Here. Like I have said before, life has give me Missile Phalanx and I am glad it has. Somehow these little critters keep showing up in life, it be finding them at thrift stores, toy stores, and as gifts they seem to keep showing up when I least expect it. 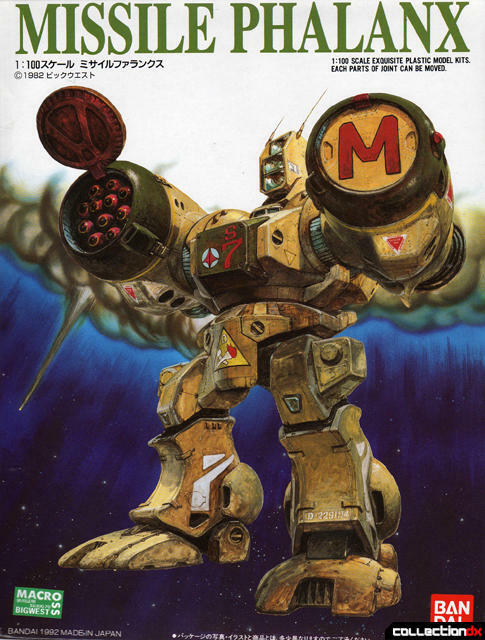 Why not, Missile Phalanx always put up a good heroic fight throughout Macross and the classic design that is nearly 30 years old still has a modern real robot look to it. Imai first released the 1/100 Missile Phalanx kit in 1982 when the original Super Dimension Space Fortress Macross first aired. 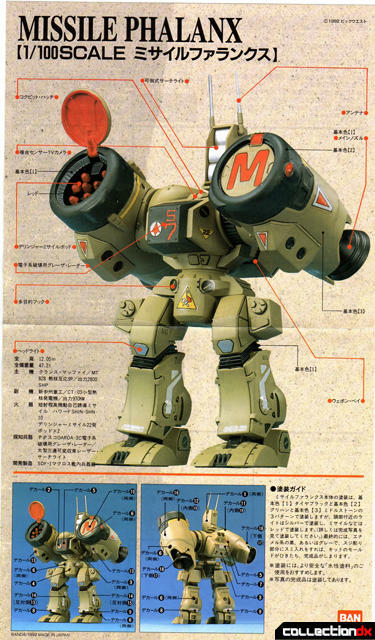 All of the 1/100-scale Macross model kits were divided between two model kit manufactures at the time, Arii and Imai. 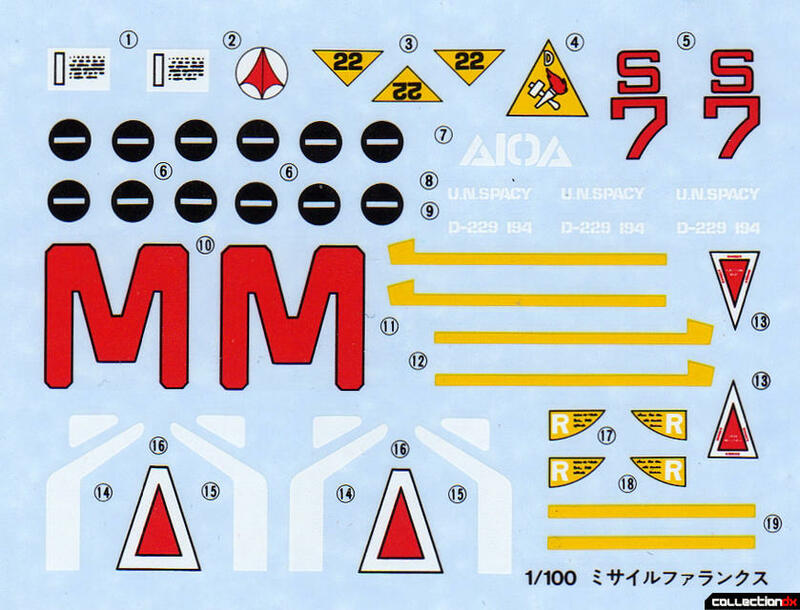 I personally feel the Imai kits were better produced and designed than the Arii Macross model kits. Imai kits seemed to have more crisp details, they did not appear completely out of scale, and they were engineered better and looked more anime accurate than Arii kits. 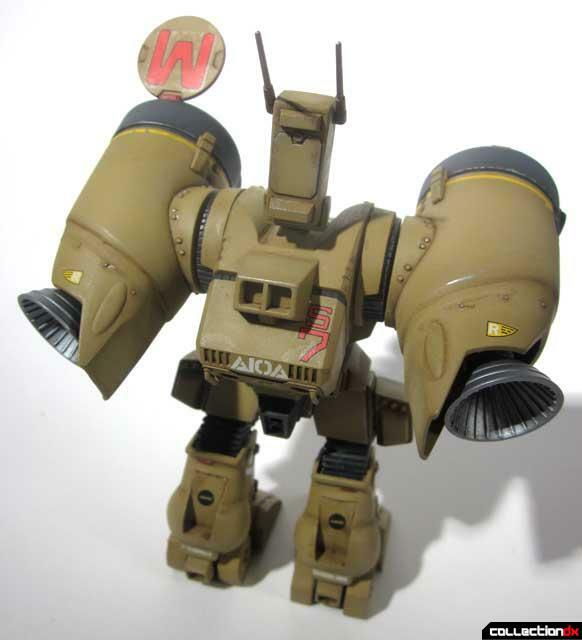 In the 1990’s Bandai reissued the 1/100 Missile Phalanx kit when they received the molds to Imai’s Macross kits when Imai closed its doors. They originally reissued them as the Macross 15th Anniversary series but later dropped the anniversary sticker on the box and have since kept it in production. 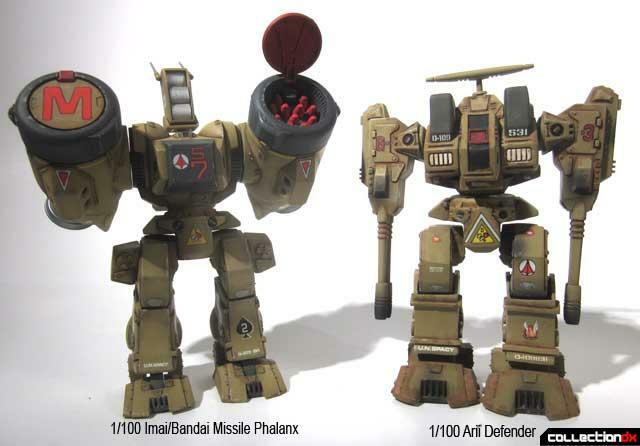 Today the Phalanx is still available as an inexpensive kit, usually selling for under $10.00. But how does the kit hold up to today’s modeling standards? 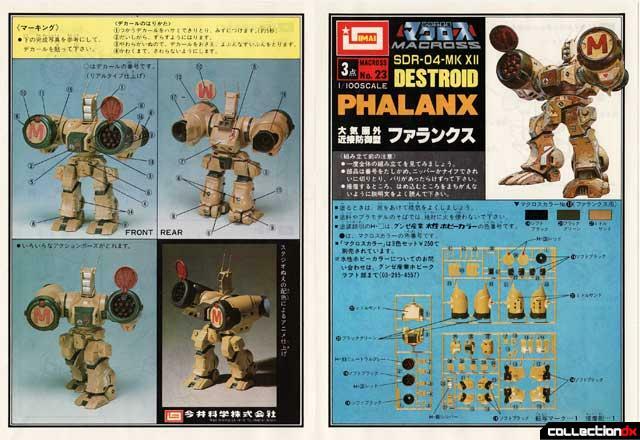 Bandai’s Macross 1/100 Missile Phalanx kit comes boxed: 3x tan sprue, 1x decals, 1x instruction flyer. The Imai kit also includes 1x tube of glue, 1x Imai/Arii promo flyer. About the only difference between the Imai and Bandai kits is the Imai kit is molded in a darker color of tan. Both decal sheets are the same. 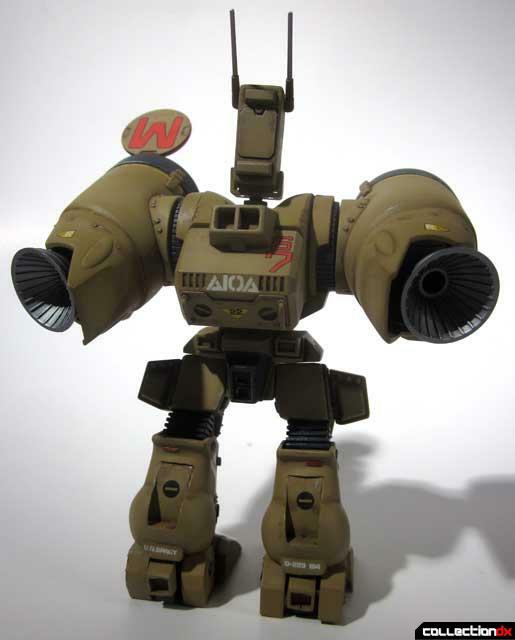 If you are a Macross collector, the box art released by Arii, Imai, Nichimo and Takatoku in the 1980’s were some of the best box art ever released for any toy series and this Imai 1/100 Missile Phalanx is no exception. Whoever has the original oil paintings is a lucky fellow. Upon opening the box you will see that the rivet detail and crisp surface detail is excellent. Compared to the 1/100 Arii Defender this kit is light years away from the lack of quality I experienced when I built that kit. These are very simple kits and they build quickly but there are few issues when building the kit that you should take notice. The legs assemble nicely but I would hold off with attaching the toes and heels until the kit is finished. There is an open vent on the heel that looked plain, so I cut out a photoetche mesh and glued it in place before paint. Like many of these Macross kits from both companies, the heels are not closed in and sheet styrene walls need to be scratch built in place to cover the holes. These were about the only modifications I made from the original kit. Sanding the rear leg area of the Missile Phalanx is also a tricky seam to fill. You will need some thin sanding sticks to get into that space. Not an easy seam to fill but it is what it is. The body was also assembled quickly, but I opted to leave the back body portion and back vents off until after the kit was painted but before decals. There is a lot of masking with this kit so a lot of planning is important to ease masking later on. 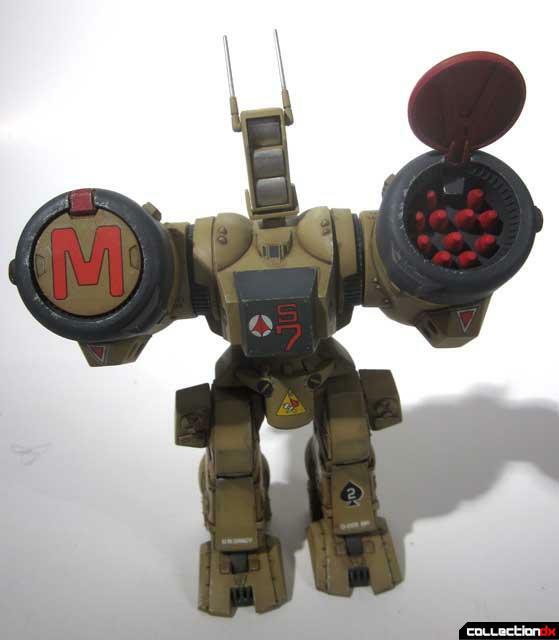 The most difficult portion of building this kit was the missile pod “arms.” There are three issues with them. The first is the exhausts, which are two parts, the base and the exhaust cone. I opted to paint the interior of the pods tan and the exhaust base steel. Then when I glued the pods together, sand out the inner seam that can be seen and touch it up again after it is smooth with tan paint. Make sure you tape off the exhaust base so no overspray gets on the parts. Do not glue the exhaust cone until after the kit is finished. The second issue is the doors themselves. If I put them in at this step it would be near impossible to paint the masks off at a later step. I had to make an important decision of leaving the doors off until after painting the kit and let the tension of the parts keep the doors on. Fast forward to when I finished the kit, I snipped off the prongs on the door with my cutter and left some small nubs. This was a careful step as if I put too much pressure; the inner missile part might fall off. The snipped prongs snapped right into place and with an added bonus the doors can open and close on the hinge. The third issue is the missile part itself. 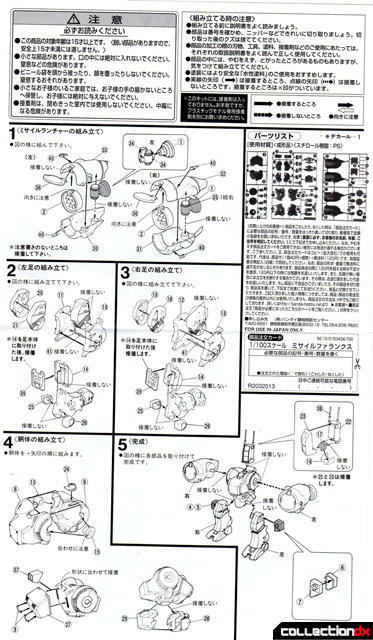 The instructions are not clear if the missile part glues to the front of the rim or the back of the wall. After lots of test fitting I decided to glue the part to the rim. Now this is where things get tricky. First glue the part to the top of the rim only and let it dry over night. The following day when the glue is cured, glue the pod halves together, applying some glue to the bottom rim. Now glue the parts together and with the end of an old paintbrush, stick it through the back of the pod and apply pressure to the bottom half of the missile part and bottom rim. 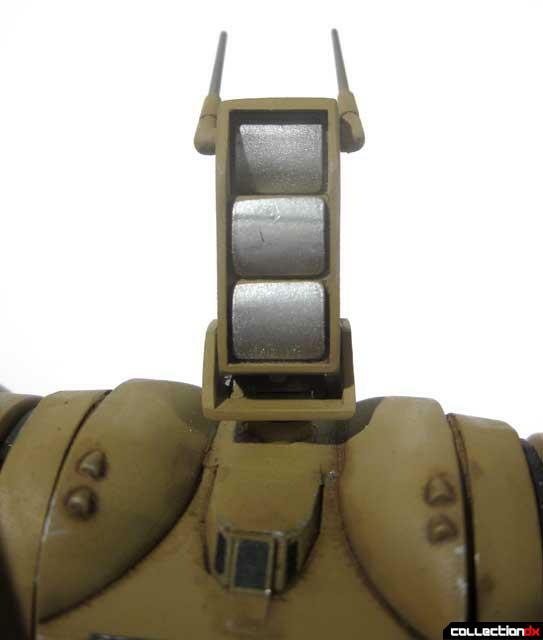 This step is very important, as if the parts do not cure properly when you snap the doors on the pod, the missile part could fall off the rim. The part will rattle around in the pods and will be very difficult to fix. If you can get past these few problems, the rest of the kit falls together quickly. After painting the kit with Tamiya acrylics and post shading with a lighter color I masked off the kit to paint the dark grey color. Like all older kits masking is an involved process and take a few days to get it right. The chest area was especially difficult to mask, as the body and waist do not separate. Just be careful and it should come out great. The most difficult part to mask was the head. Replicating the lens in head is chore. In fact many builders put small lights in the head so it could look more realistic. Since I tend to build out of the box for my Collection DX reviews I opted to mask them off which ended up being quite a nightmare. First I painted the part gloss black and then the next day I applied Alclad chrome silver paint. Alclad is a great silver paint as you can mask it off after one is through painting unlike most silver metallic paints. After I sprayed the chrome silver I tried masking off the part and failed miserable. Luckily I have a plotter at work and I was able to create a custom mask to fit the lens exactly. Without the plotter I am not sure how I would have done it. I glossed everything with Testors Gloss and applied the decals. The decals went on great but I could not get the bottom halves of the white flash decals on the leg to settle properly even with Solvaset. 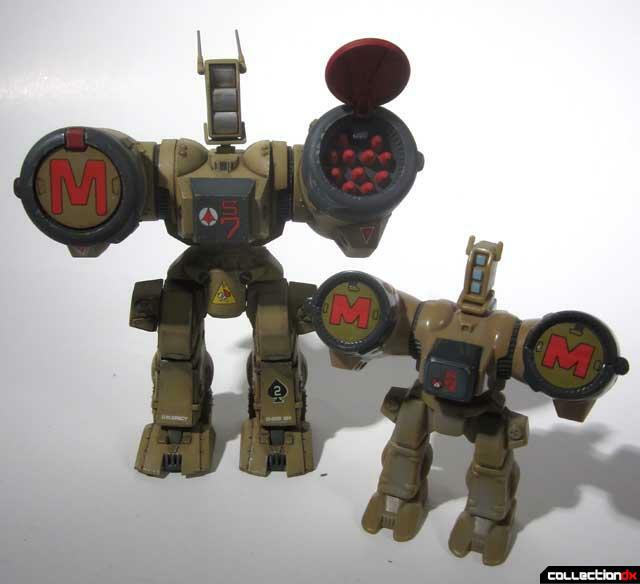 Also the “M” on the missile doors has a lot of silvering and I suggest cutting them out into shape, as it was silk-screened on a clear decal box and not to shape. 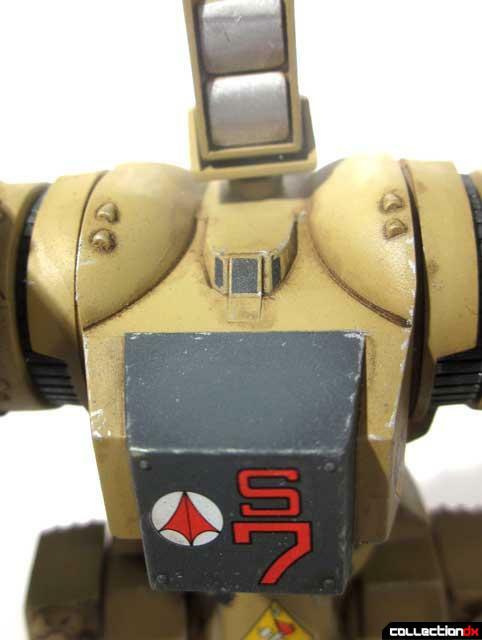 The Bandai decals instructions were also wrong on a few occasions, the most prominent being the yellow decals around the missile pods. Look at the box art to put those on as the instructions are not correct. A huge disappointment with the decals was there was not any inclusion of any kind of “Nose Art” decals, which at this point I feel all Macross model kits should come with, especially Destroids. 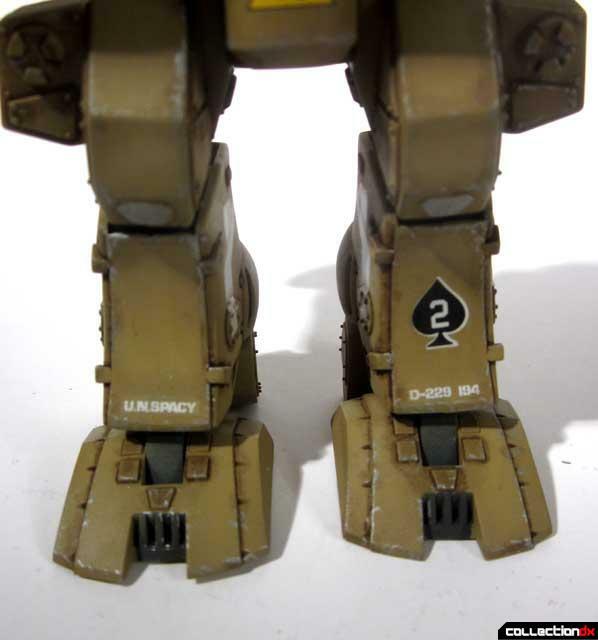 Going through my spare decal sheet box I found a nice spade with the number “2” written on it and applied it to the lower left leg. 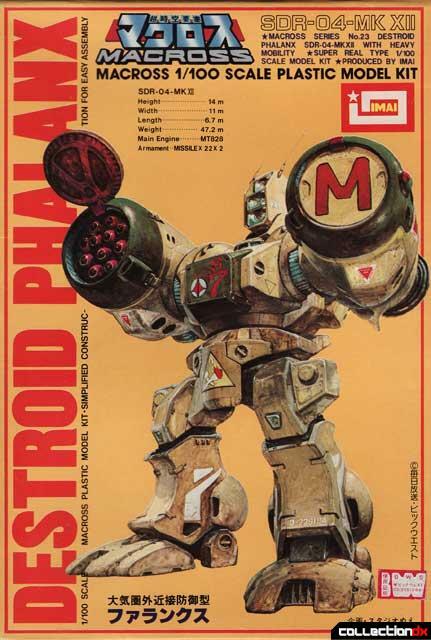 I dubbed my Destroid “Deuce of Spades” and one day when I find small letting I will add the name to my Missile Phalanx. I also had to use spare black decal to replicate the window for the cockpit. It was real difficult to cut out such small decals but it greatly improves the realism of the kit and adds a human element to the Destroid. I flat coated the entire kit and assembled the final parts of the legs, head, missile pods and toes. I did my usual mix of black and burnt umber oil paints as a slight wash and picked out bolts and other small details. I finally used a silver pencil to make out scratches throughout for realism. Like many old kits there is a lack of articulation but I believe the Missile Phalanx looks the best in a neutral position. I think it would look better with one leg slightly angled out but knowing of the complex nature of how Destroid hip joints work, I do not think it is worth the trouble this time around. Standing back this is still one beautiful model kit. 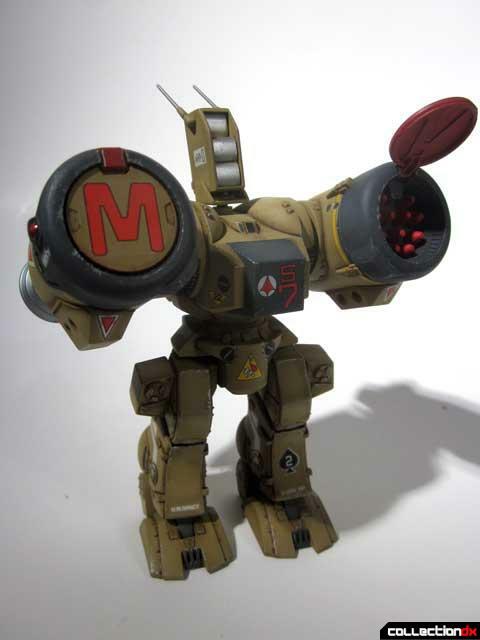 Imai/Bandai’s 1/100 Missile Phalanx still holds up well today for Macross modelers. I am glad I was finally able to include this kit into my collection of Destroids. Because it is an inexpensive kit and originals are still plentiful, there should not be any reason to not pick this kit up either for the collection or to build out for novice and experienced modelers alike. Next: Part 3 Imai/Bandai’s 1/100 Destroid Tomahawk. 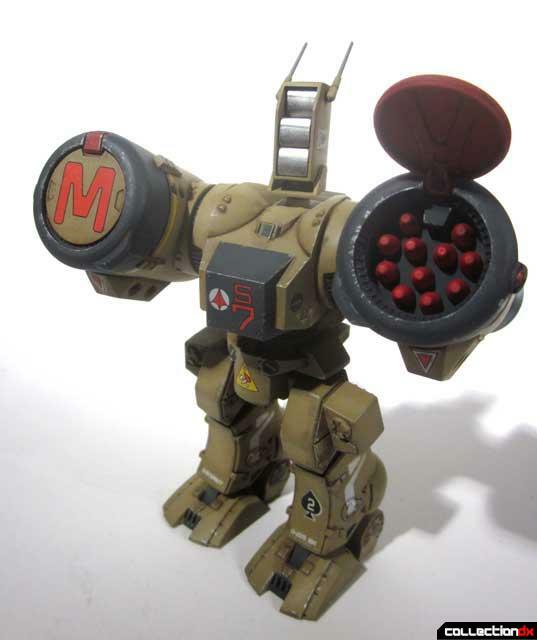 This is one of the very few missile mechs that I don't like. This is why Destroids are usually deployed from multiple elevators- they can sink back into the hull under cover quickly for reload; they are in essence mobile turrets. Just... wow. Leo you are amazing. Thanks Rob! The key is the post airbrush shading, oil paints and silver pencil. A combination of those three things make the kit pop!